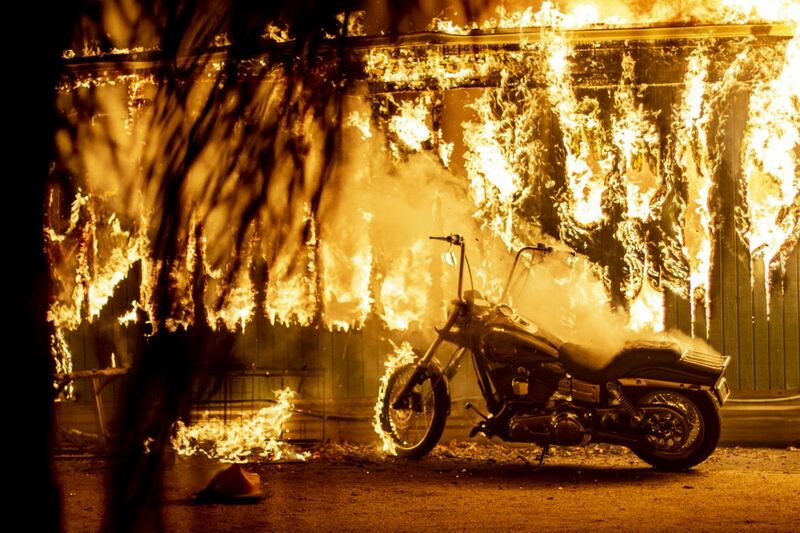 A motorcycle begins to catch fire outside an engulfed structure at a park for recreational vehicles in Malibu, California. AGOURA HILLS, Calif. – College professor Jeff McClenahan hiked up a winding road Saturday toward a terrible unknown, expecting the worst. The embers were largely gone Saturday, but the smoke remained – inescapable, pooling in lower elevations. Spot fires remained, and the ground smoldered. Among the things consumed by flames was Paramount Ranch, a fake Western town used for HBO's "Westworld" and other shows dating back more than a half-century. In Malibu, Pepperdine University's 3,600 undergraduates were ordered to shelter in place as the fire approached. That decision by university officials proved controversial, especially with parents, after the flames reached hillsides near campus. Overnight, debate had raged about whether the students were in the safest possible spot – or trapped and in danger.